Again, residents of Oregon who have a tax liability can take a tax credit of up to $500 per person for the current tax year. It works this way - make a contribution to Boston Mill Society or many other Oregon nonprofits and a matching contribution to the Oregon Cultural Trust and receive an Oregon tax credit for the amount to the Cultural Trust. Both contributions are deductible on your federal income tax. A brochure is enclosed which provides further information. Act now to take advantage of this opportunity. You can’t have a water-powered mill without water. How and where does the mill get its water? 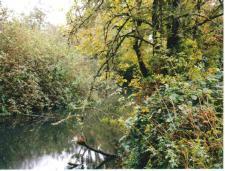 About 3/4 mile south of the mill, a small dam is located on the Calapooia River. This dam directs some water into a man-made canal called a “millrace. For the past few decades, parts of the millrace” have become overgrown with blackberries, preventing a detailed study of its condition. Recently this has changed. 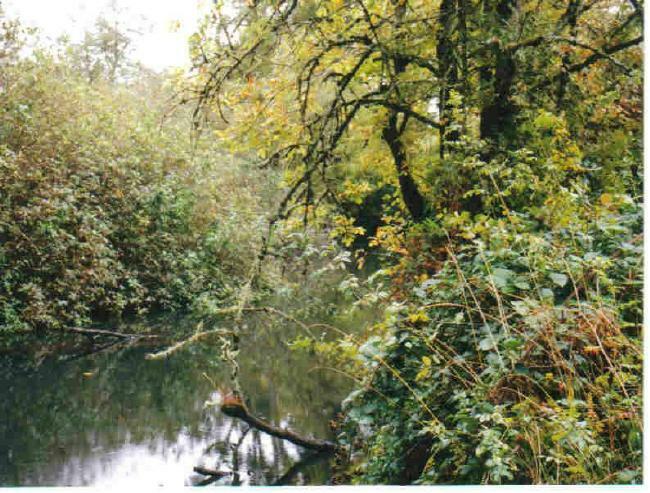 Oregon Parks and Recreation Department, owner of the mill, hired a contractor to mow/remove most of the blackberries. A few thin spots in the levee have now been located, but overall, the millrace condition is in pretty good shape. Thanks are owed to millrace neighbors who allowed tractor access to the millrace. 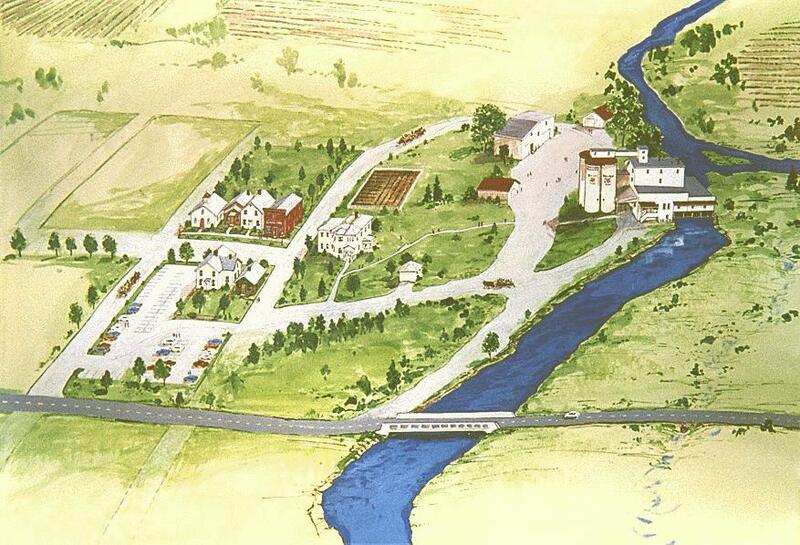 The millrace has been doing its job of delivering water to the mill since 1858! Since that year, the mill has run 100% on water. This persisted until almost 1950! The mill keeper’s house also remained without commercial electricity until after WWII. A small water-powered electric generator in the mill provided lights for the mill and house beginning in 1903. But this electricity was shut off early in the evening, so lights in the house were then provided by kerosine lamps. The main reason for providing optional use of grid electricity was to permit upstream farmers to have access to water for irrigation. This arrangement is no longer necessary since the mill is no longer in flour, feed or electricity production. When the mill opens to the general public in the Fall of 2006, it will be operated for short periods of time for demonstration milling only. Every two years Friends of Oregon State Parks have a conference for fun, information sharing and learning. Friends are volunteer nonprofit organizations who have a contract to supply a large variety of services. 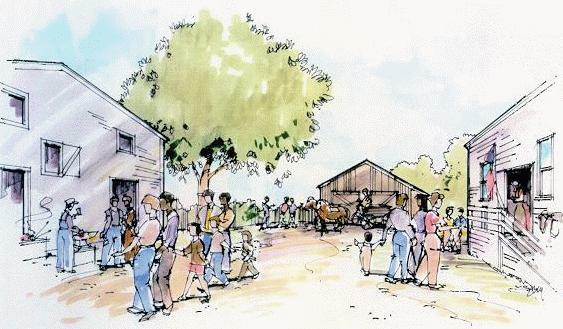 They may lead tours, operate museum stores, help build interpretive panels and displays and many other projects. They may raise funds to finance some of these projects. This past October, many of the Friends Groups met in Linn County. The kick-off was at Thompson’s Mills. 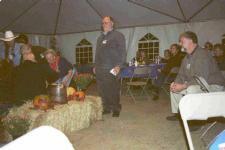 A giant tent was set up for a BBQ, square dancing and other fun things, including hayrides around the grounds. This writer also had the special opportunity to help with tours of the mill. It was truly a special evening for volunteers and parks staff people to learn about one of Parks latest acquisitions. And even later in the evening, water was used to power the turbine so visitors could see, hear and feel the mill come alive. Many of the people attending said it was the best event they had seen at a park. Around the first of October, water was allowed to enter the flume. As water filled the flume, the first turbine began to turn the power shaft and the mitre gear attached. This caused the great crown gear to begin rotation together with its shaft and pulley. The crown gear is provided with hardwood teeth carefully fitted into its frame. The pulley was fitted with a wide belt that led to the first floor where it operated a pellet mill. 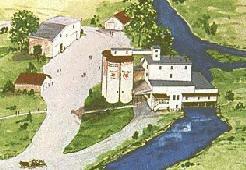 With all of this operating, the mill again became alive. In a previous newsletter we described a hands-on display showing how grain and flour were moved throughout the mill. The display includes an auger, elevator and chute to complete a circular movement of materials. One person operates the auger by hand, another operates the elevator. All can see how this system works. This interpretive display has proven to be very popular! This display shows some basic components that Oliver Evans combined to invent modern industrial automation. All of this inventive activity took place during the early 1780's. The founder of Husum, Washington, Martin Thompson, will be recognized for his role in development of West Klickitat County. The occasion is dedication of the new Senior Center in White Salmon; Wednesday, December 14, 7 p.m.
Martin left his native home near Husum, Germany in 1870 bound for Iowa, America. He met and married Sophia Schultz in Iowa, where their first child was born. The family left Iowa for Nebraska where two of his brothers were living. A second child was added to the family, which then continued on to the White Salmon River in Washington Territory. He built a grist mill at The Falls. He became Post Master of Wilkinsheim and later named it Husum. He worked on the Cascade Locks. Four children were born there, and one lost. About 1886 the family left for Oregon. Martin had retained the property at Husum. His eldest son proposed his father establish the Husum Power Company of White Salmon. The plant was built at the former location of the gristmill. The plant went into operation and supplied power for electric lights to White Salmon. At Martin’s death in 1910, the power plant was sold.